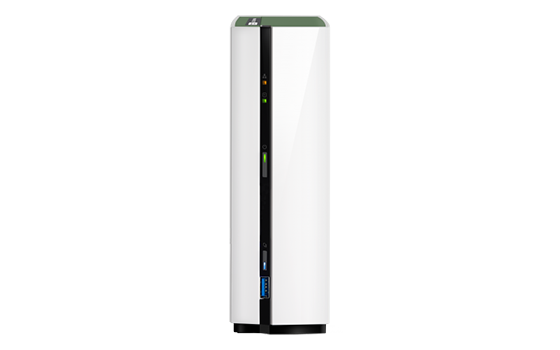 The TS-228A features a Realtek RTD1295 quad-core 1.4GHz processor, 1 GB RAM, and a 1GbE network port to provide performance of up to 112 MB/s. If you decide to encrypt your files with AES-256 encryption, the performance is still an impressive 112 MB/s - allowing you to ensure your privacy without sacrificing performance. The minimal and streamlined design of TS-228A makes it fit easily into your home. Featuring a unique, tool-less design, setting up the TS-228A is so easy that it doesn't even need a screwdriver! By practicing safe computer habits and with the TS-228A handling your file backup tasks, you can rest easy knowing that your data is safe. QNAP's NetBak Replicator backup utility can assist in backing up/restoring files on a Windows® PC while macOS users can set up Time Machine to save to the TS-228A. With the energy-efficient and quiet TS-228A, you no longer need to use different downloading utilities or to keep your computer running all the time. Use Download Station to search for downloads and to manage your download tasks. The all-new QVHelper can help you stream and decode multimedia files to media players on your computer and/or mobile devices. The Qfinder Pro utility can also save time and NAS system resources by transcoding media files locally on your PC before uploading them to the NAS. With the TS-228A your audiovisual experience is smoother and more convenient with useful apps and everything you need to enjoy great multimedia entertainment. The TS-228A has a multitude of companion mobile apps to extend its functionality to your smartphones and tablets. If you're on the go for business or pleasure, your files and data are only a few taps away. Qfile lets you access the files saved on your TS-228A at anytime, from anywhere so you can ditch your thumb drives forever. Qsync quickly and effortlessly syncs files across different platforms and multiple devices so you'll never miss any important information again. Use Qget to remotely control your TS-228A to download files on the go. Files will be automatically downloaded to your TS-228A. Use Qphoto to view and share photos stored on the TS-228A. You can also instantly upload photos/videos to the TS-228A as they're taken, so you don't have to worry about storage space issues or if your phone is lost. Enjoy your music on the go with Qmusic! Search through your music and edit playlists before streaming or downloading from the TS-228A to your device. Qvideo plays videos for you, and you can further share videos instantly and even stream them to Chromecast. Management features are also available on the go, such as categorizing, tagging and rating. The TS-228A requires only 12.21 W, providing powerful features without a high power bill. Other smart energy-saving modes help to minimize electricity usage, and with a quiet cooling fan both the noise and heat generated by the TS-228A is kept to a minimum. 3. Team folders as file center for better collaboration Note: The maximum number of sync tasks is 32 for x86 devices and 5 for ARM devices. 1. Monitor NAS system resources including CPU, memory and network. 2. Monitor NAS storage resources including volumes, RAID, and disk activity. 3. Monitor the resource usage of NAS applications. 1. Report issues to the QNAP support team, with automatically-collected system information. 2. Allows QNAP support engineers to remotely connect to the NAS to fix issues (with user permission). 1. Supports mounting cloud drives (such as Google Drive, Dropbox, Microsoft OneDrive, Microsoft OneDrive for Business, HiDrive, Amazon Cloud Drive, Yandex Disk and Box). 2. VPN Server: Up to 100 clients. 3. VPN Server: Supports domain users as VPN users. 4. VPN Client: Supports PPTP, L2TP/IPSec & OpenVPN VPN protocols. 3. Support CUE indexing ﬁle for APE, FLAC audio format. *DRM-protected content is not supported. Download the QNAP TS-128A / TS-228A Series Brochure (PDF).